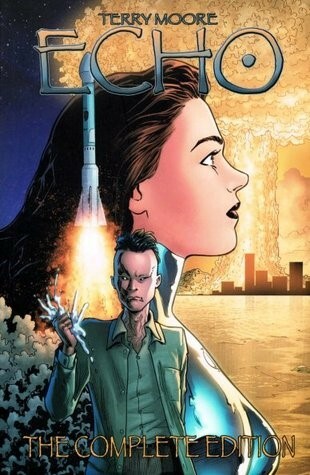 For my first time reading a comic book, I was delightfully surprised how immersed I was into the story from varying plot-twists and themes presented throughout while reading Echo: The Complete Edition. 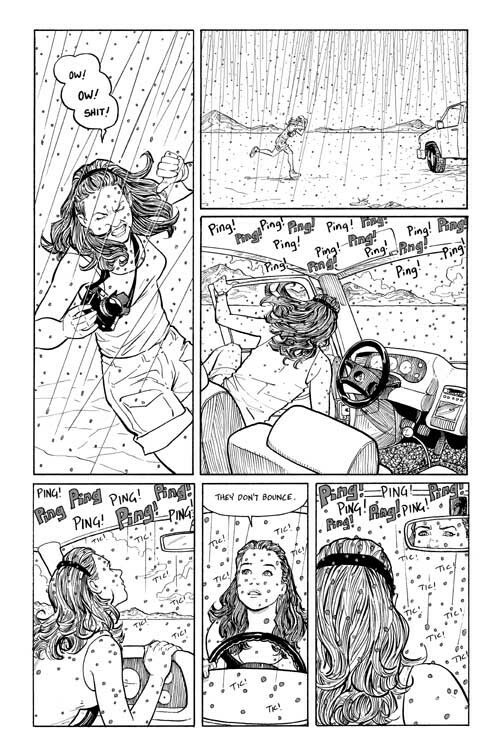 Published through an American independent company called Abstract Studio, Terry Moore, author and illustrator of the 30-issue story, begins with the life of Julie Martin, a young photographer facing internal and external tragedies all around her. From avoiding her signature to be imprinted on the divorce papers filed by her husband, Rick, to financial instability, Julie suffers without any assistance or support as she vents to her dog, Max. From the first few pages, the author displays womyns’ dependability on men for financial and emotional support. Once we meet our main character and learn about her life in the present moment, we join her on her journey as she learns she could stand on her own if she wanted to, even though does not fully break away from habits. During a test flight for a new beta suit developed by HeNRI (Heitzer Nuclear Research Institute), Dr. Annie Trotter dies during the first run over Moon Lake. No remains of Annie can be found and neither can majority of the beta suit! Discovering further evidence at HeNRI Headquarters, only two people were spotted at Moon Lake that day: Julie Martin and an unidentified man by the lake. Capturing a photograph of the explosion, Julie finds herself in a rainstorm of particles that won’t detach from her and slowly beginning to form a cocoon around her body that is not unpleasant, however it was difficult to remove. Searching for his missing girlfriend, park ranger Dillon Murphy waits anxiously to hear from Annie until he visits HeNRI to find out she had died and there is no body. Soon after his encounter at HeNRI, Julie and Dillion meet during a happenstance as authorities approach her wanting to collect the remains of the beta suit, but she attacks them instead; or did she? Now, Julie and Dillon are on the run from HeNRI and investigator Ivy Raven, hired to collect the Beta Suit one way or another. With the help of former Air Force veteran Dan Backer and his group of biker friends, they travel across the desert leaving traces of devastation and clues of where they’re heading. The more pieces of the suit begin to form on Julie, the more she learns about its power and importance to keep it away from HeNRI’s main goal: creating the ultimate bomb. Other characters the story features include Pam, Julie’s sister; Jack Cooper, Annie Trotter’s assistant; Hong Liu, researcher that develops a formula to deactivate the Beta Suit; and Tambi, from Moore’s Stranger in Paradise. While reading this comic, I couldn’t help to think about all the womyn stereotypes that are being portrayed. Ivy Raven is a hard-working single mother and Julie is a young single womyn who can barely provide for herself. Though the womyn had shining moments to let the reader explore their perceptions, the men were just as interesting. The men in the story were part of various social groups and had varying life experiences, but their remarks I could not leave unquestioned. Womyn are patient creatures throughout all the species, but there have been many points throughout a womyn’s life where she relinquishes her prey to search for her next big bite. Professor Foster’s personality in Echo is not one to be underestimated. A sovereign overseer who cares little about his workers and the success of a project that could destroy the world. He is willing to step over anyone to complete his life’s ultimate work, when in reality, Annie was hired by HeNRI based on her thesis on the same concept project that ended in her death. Although the comic sexualizes womyn in more ways than I can count, the female stereotypes prevail even more. The dynamic of the numerous personalities, careers, and lifestyles cohesively affect the storyline in ways that could inspire any person to put in the effort to make a difference in the world or stand up to misogynistic men. This particular quote is a summary of not only historical reference, but to what is considered repeated history in which the story is based upon. Other historical references throughout the text discusses the beginning of time when Adam and Eve’s sons Cain and Abel and their blowout, and my favorite historical spoof was when Julie’s bra was “burned off” due to the beta suit, reflecting on the Women’s Liberation Movement of the 1960s. Overall, I highly recommend Echo. The story not only creates dynamic and brings out the reader’s inner feminist, but questions the inner workings of war, power, stereotypes, control, history and sexism. What I enjoyed most about Moore’s work are the various themes and demonstrating how everything relates to one another in a contrastive way. All images used with permission of the publisher. Full Disclosure: The reviewer received a copy of the comic for review.